NEW YORK, NY--(Marketwired - November 30, 2017) - Lucktastic, a pure play, free app and entertainment destination that is reimagining winning experiences, rewards and discovery, today revealed additional data about how the app's 15 million users are hoarding in-app rewards to save up for holiday gift cards. According to the data, the team from Lucktastic reports that reward redemption for big box stores and popular retailers increased by 8% year over year on Black Friday and 129% year over year on Cyber Monday. 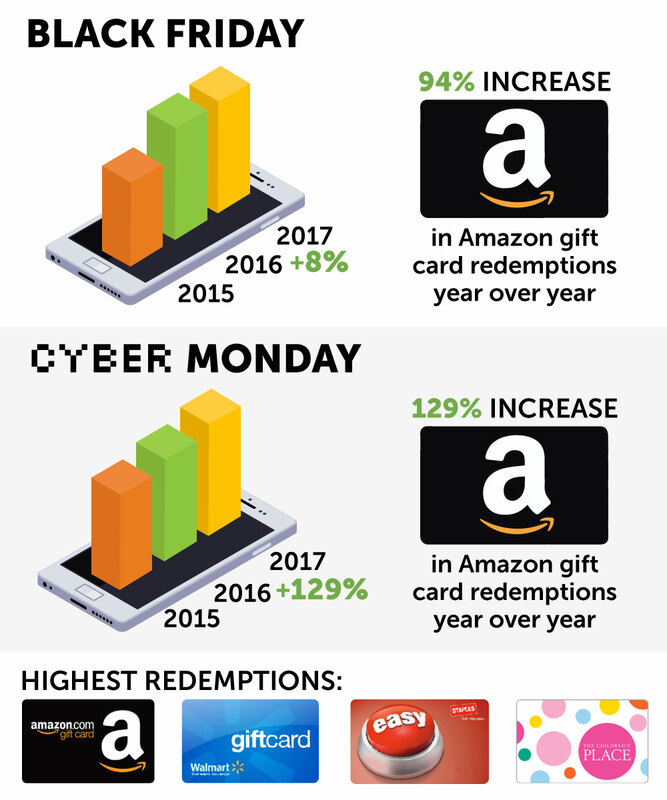 In addition, the app saw a 94% lift in gift card redemptions for Amazon gift cards on Black Friday and 242% lift for Amazon gift cards on Cyber Monday. More detail has been illustrated in an infographic that can be found here: http://bit.ly/2AGcvLM. The company is also announcing a new mobile shopping category powered by Button. Lucktastic users can now shop with some of the world's largest mobile retailers while earning Lucktastic rewards that can be redeemed for gift cards, sweepstakes entries, and more. "With Cyber Monday being the largest online shopping day in US History our team was not surprised to see a huge spike in reward redemptions, especially for Amazon gift cards," said Alex Betancur, co-founder of Lucktastic. "We continue to offer players new and unique redemption opportunities and the addition of mobile shopping is just another great way to reward our loyal users as they shop for the holidays and more online." In addition to the data above Lucktastic revealed that the top gift card redemptions for Black Friday included Amazon, Walmart, GameStop, Toys'R'Us, Staples and Bath & Body Works. The top redemptions for Cyber Monday included Amazon, Walmart, Staples and The Children's Place. Considered one of New York City's fastest growing mobile-first companies, Lucktastic is the leader in delivering innovative promotions, rewards, and instant winning experiences. The company connects consumers with top partners in mobile gaming, commerce, branding, and product discovery. The pure play, free to play Lucktastic app launched on Android in 2014 and has quickly built an engaged and loyal customer base attracting nearly 15 million installs in the US on Android and iOS. With a dominant social footprint that includes more than 4 million fans and followers, the Lucktastic brand reaches 12 million weekly unique American consumers. For more information visit www.jumpramp.com. Button (www.usebutton.com) is the premiere mobile partnership platform for the world's leading brands, providing a scalable solution and the simplest way to build partnerships that drive commerce. Through proprietary technology and hands-on service, Button facilitates discovery and transactions among consumers with a user-first experience. Current partners on the platform feature industry leaders such as Walmart, eBay, Groupon, Hotels.com, and leading publishers around the world. The company was founded in 2014 and was voted as a top 50 Best Workplace by Inc. Magazine and a Best Place to Work in New York by Fortune in 2017. Button has raised more than $35 million in Seed, Series A, and Series B funding from Norwest Venture Partners, Redpoint Ventures, Greycroft Partners, DCM Ventures, Accomplice Ventures, VaynerRSE and others.